To Reach Remission, It Is Best To Have A Support “TEAM” Helping You. My Chiropractic and Massage Techniques Are “VERY” Different and “VERY” Effective. You cannot afford to have people around you advising you, or giving you normal medical, chiropractic or naturopathic therapies that go against my new unique success-based approach!!! — Even my spinal correction approach is very different than given by any chiropractor and without this new approach, your spinal curve and cervical subluxations will just keep on coming back out of alignment, within 5 minutes to 5 hours. — The awareness you need your massage therapist and your chiropractor to have, in relation to my unique approach to spinal correction, muscle normalization, respiratory efficiency, sleep, and digestion, is “EXTREMELY” important in helping you gain “LONG-TERM” success. My Nerve Massage, Spinal Correction Vibration Therapy, B.A.10 Treatment Approach, and Some Of My Assessment Tests Are Very Unique & “VERY” Effective. Because some of my ideals are very different, I actually encourage you to invite any practitioners you are calling on to treat you, to come to a one-hour “Familiarization Session” on Day 2 or Day 3 of your treatment so they learn a number of natural stress signs of the body to monitor, which were discovered through medical research, which are no longer taught in health practitioner accreditation training, some of the things they “MUST DO”, and some of the things they “MUST NOT DO” when they work on you after your time with me is completed. For example: You, your partner and “ALL” practitioners you are seeing, “MUST” know how to palpate the C1 vertebra (Atlas) to check it’s alignment, and know how to recognise if you have a twisted pelvis, as these are by far, the most influential symptom-provoking problems. 11 Muscles Have The Most Predominant Influence Over The Development Of Rigidity Symptoms, From Head To Feet, & The Trapezius and Sternocleidomastoid Muscles Are The Most Influential. Some of the spinal supportive muscle abnormalities you, your partner and any person doing massage on you, “MUST” know about, are: – (1) Tension levels in the lateral border of both your trapezius muscles. (These neck muscles are by far your most important muscles to monitor.) — (2) Both your Sternocleidomastoid muscles can also have a negative influence on head posture and position, and, (3) your both calf muscles can cause extreme “Plantar Flexion” (walking while standing on tiptoes), in advanced Parkinson’s disease and MS patients, and in many of the patients diagnosed with the other 7 rigidity disorders I cater for. — Whilst there are 11 main muscles that influence the development of the vast majority of rigidity autoimmune symptoms, the main one you need to check “EVERY DAY” until your symptoms subside, are both your trapezius muscles. 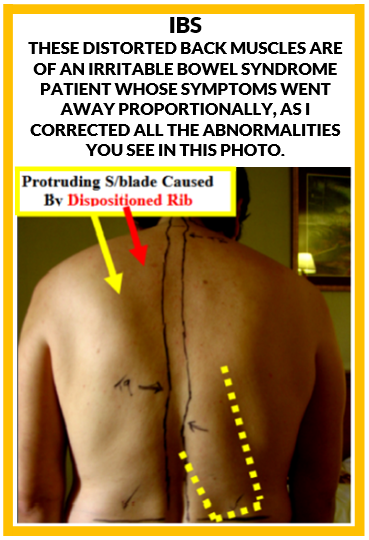 “ALL” Rigidity Patients Develop Very Tense (Rigid) Trapezius Muscles. 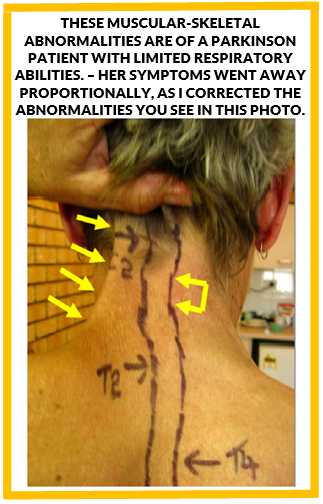 This next photo shows excess tension in only one trapezius muscle and combined with the skeletal abnormalities this caused, she developed Parkinson symptoms and breathing difficulties. 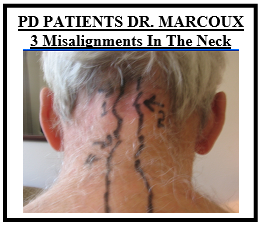 Practitioners Are Not Trained To Check Neck Muscle Tension On “Rigidity” Patients. There Are Many Body Stress Signs To Help You Know Why You Don’t Feel Like You Have The “GOOD” Body You Once Had, &, If You Can Read Them, They Will Help You Into Remission. You Need All Members Of Your Support Team To Know My Very Different Approach. Please feel free to include an invitation to your medical doctor, your neurologist and your chiropractor if you would like them to attend my one-hour awareness talk, as the more they know about my teachings on overcoming negative muscle memory, my nerve massage, and how I teach you to regulate certain emotions to encourage a release of specific hormones for sleep and stress management, the better it is for your “continued” success. You Must “ALL” Learn To Monitor 4 Things, While You Complete Your Time With Me. There are 4 things you “ALL” need to monitor every day until you reach remission, to stop your symptoms from getting worse, to eliminate your symptoms fully “OVER TIME”, to keep your C1 vertebra (Atlas) and your hips in alignment “AT ALL TIMES”, and to keep you motivated. — With some patients, it can be difficult to deal with the “DOWN DAYS” when you wake up and just don’t feel like persevering, and that is normal, but you and your whole support team needs to know how to help you deal with such times. By Far The Most Important Things To Monitor, Are Your Hip and Atlas Alignment.